Hi there, in 2000 I adopted a GSD that had come from a shelter, tho she had been in training to be a K9 dog, she lacked the focus to be a K9 officer. when she got to me she was in good physical shape and good health. I couldnt have been luckier there. i was in the process of remodeling my home and was living in the bedroom, bathroom and kitchen. with a 70lb GSD. it was cramped to say the least. I could have never made a better choice. Casey was the most loving, loyal, wonderful companion I could have ever asked for. My father raised GSD puppies for the local sheriffs office for their K9 program and he kept trying to take her home, unsuccesfuly i might add. Casey was with me thrugh all the trials and tribulations of loosing my father to lung cancer, moving to a new state (twice) and making a new start in the south. She has given me an unwavering respect for the german shepherd in all its respects. I am now working as an animal control warden in Louisiana and i see way too many dogs destroyed for no other reason than they are unwanted. I am working with the local rescue to make sure than any GSD that comes through our doors is found a new home. I have recently lost my Casey to degenerative myolapathy (dont know if i spelled it correctly) and miss her terrably. 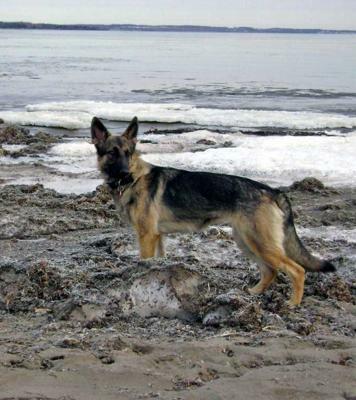 noting that, I have also decided to foster a 3yr old GSD named Gabby. it has only been two days since i got her home and she has already formed a long lasting bond with me. She reminds me so much of Casey. from the sound of her bark, to the sound of her laughter "breathing" and it warms my heart to think i might have been lucky enough to have gotton a second dog with a heart the size of Casey's. I read your story and applaud you for giving another dog a home. I too lost a dog to degenrative myelopathy It is heart breaking but in order to honour his memory and keep on going I also have opened my heart and home to another shepherd who lost his way.